Earlier this year we went over general exterior signs. 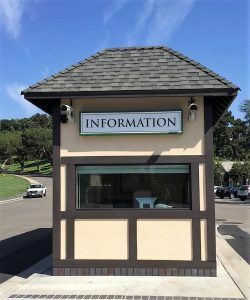 As you can imagine, there are many types of outdoor signs so categorizing exterior and interior signs just the first step to exploring the many different types of signs there are. Today I’ll be going over a few different types of building signs. Even within building signs, there are many different types. Which one you choose is mostly up to your style preference. 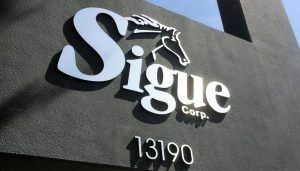 When you want large, dimensional letters that can be illuminated, you’re looking for channel letters. 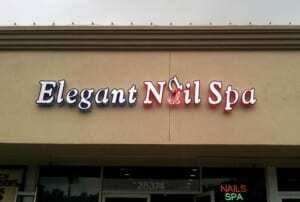 We can make front-lit channel letters, reverse-lit channel letters, or both which are called compound channel letters. If you need a certain color displayed, you want front-lit because we can use different colored acrylic or digitally print a specific color onto acrylic and internally illuminate it. Reverse-lit channel letters look great, but no matter what color they’re painted, they will look black at night time since the light is coming from behind. With compound channel letters, you can have both forms of illumination and even have different colored LEDs. Channel letters can range from 3 1/2″ to 5″ deep. If you want individual dimensional letters that don’t need to be as thick and don’t need to illuminate, dimensional letters are a great choice. We can use acrylic, aluminum, or paint either to get the color you want. If you have an intricate logo that you want to be made as just one piece, we can digitally print it and overlay it on the face of the acrylic or aluminum. Cabinet signs are made very similarly to a front-lit channel letter, but instead of being shaped into different letters, we make one large frame with one large sign face. On the face, we can digitally print anything you want like your logo, hours, contact information, etc. and internally illuminate it to advertise the information all day and night. A logo box is a similar concept, we just shape the returns to the shape of the outline of the logo and digitally print the logo onto the face.